Antiquarian bookshop Lont is the only antiquarian bookshop in Amsterdam, which specializes in children's books. There is also a department of philosophy, history, art and a wide choice in prints. In addition to prints for children you will find prints of Amsterdam, plants and also some medical prints. In the nostalgic shop you can look around and find something you didn't expected. This is the 'magic' of the shop. We buy our books and prints via individuals, auctions and colleagues. On the website under 'inkoop' you will find more information about what to do with your own books and prints if you want to clean up your own bookcase. Every Saturday on the Noordermarkt and sometimes also on Mondaymorning. Please call me if you want to visit me on Mondaymorning. Every Friday on the Bookmarket on the Spui www.deboekenmarktophetspui.nl. 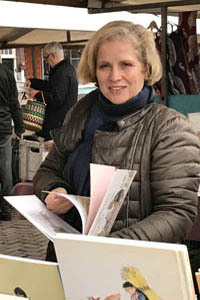 On Saturday on the Noordermarkt.